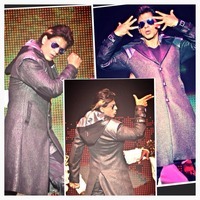 Hey Malaysia be ready to rock with super star @iamsrk! Show him all your love & support! 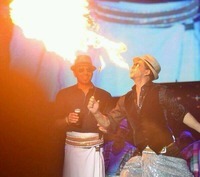 He's coming to entertain U even though he's unwell! 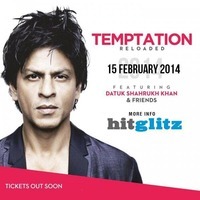 KING of Bollywood, Datuk Shah Rukh Khan (SRK) is confident he can perform well at tomorrow night's Temptation Reloaded concert, despite the injury he had sustained on his left foot. 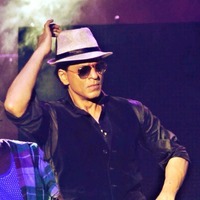 Shah Rukh Khan, 48, said he is recuperating well and is sure that he can dance well thorughput the 3-hour concert, which will be held at Stadium Merdeka. "I'm getting better and I'm confident to 'move' tomorrow night. If you ask me to dance the Zapin, I can do it, plus I've done it before!" 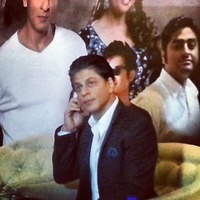 Shah Rukh Khan joked. "I'm willing to do anything to please my fans here. I love Malaysia and I always have the urge to come to this country," said Shah Rukh Khan at the Temptation Reloaded press conference held at Ritz Calton Hotel, Kuala Lumpur this afternoon. SRK suffered the foot injury while filming Farah Khan's latest flick, 'Happy New Year'. His head and shoulders were also injured in the incident that took place last January. 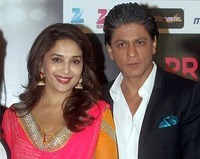 Shah Rukh Khan and Madhuri Dixit can't wait to entertain fans. Accompanying him is Bollywood's Queen, Madhuri Dixit. 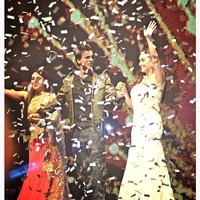 This is Madhuri's first visit to Malaysia. "I'm excited to come here. So far I have only heard about Malaysia from my husband because he was here 15 years ago. "This is also the first time I'm sharing the stage with Shah Rukh and we look forward to entertaining the fans tomorrow night," she said, flashing her gorgeous, famous smile. The beautiful actress is among the heroins synonymous with Shah Rukh Khan and the duo had paired in films such as 'Dil To Pagal Hai', 'Duplicate' and 'Badshah'. She, along with rapper Yo Yo Honey Singh, were present at the press conference. To top it off, actress Rani Mukherji will also be performing tomorrow night and the media was told that the actress is currently on her way to Kuala Lumpur. Shah Rukh Khan's Temptation Reloaded concert was initially planned to take place on October 11 last year, but was postponed due to President Barack Obama rumoured visit. 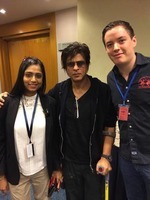 Earlier today, Shah Rukh Khan arrived at the Kuala Lumpur International Airport (KLIA) at 7.40am this morning and was greeted by some of his doting fans and members of the media. The beautiful actress [Madhuri] is among the heroins synonymous with Shah Rukh Khan and the duo had paired in films such as 'Dil To Pagal Hai', 'Duplicate' and 'Badshah'. Gee, I guess I need to watch Duplicate and Baadshah again! I must have missed Madhuri in those! Datuk Shah Rukh Khan performs at the Temptation Reloaded concert in Stadium Merdeka. 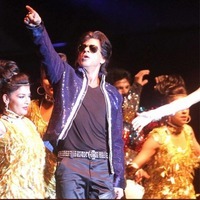 KUALA LUMPUR: It was an entrance fit for a king as Datuk Shah Rukh Khan finally took to the stage Saturday night at the Temptation Reloaded concert in Stadium Merdeka, Kuala Lumpur. About 8,000 screaming fans greeted the Bollywood superstar as he performed a medley of his biggest hits on a spectacularly lit stage. "I have a broken leg and a broken shoulder, but my heart is intact and I'm ready to share it with you!" said Shah Rukh, in reference to recent injuries he had suffered. Setting the stage for him were equally infectious performances by legendary Bollywood leading ladies Rani Mukherji and Madhuri Dixit, as well as bhangra-hip hop artiste Yo-Yo Honey Singh. 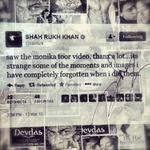 Beautifully put Shahrukh! Of course he finds the words to melt people's hearts.